After Christmas, each year, I generally show you a dead Christmas tree that someone left in the street for the garbage people to collect. 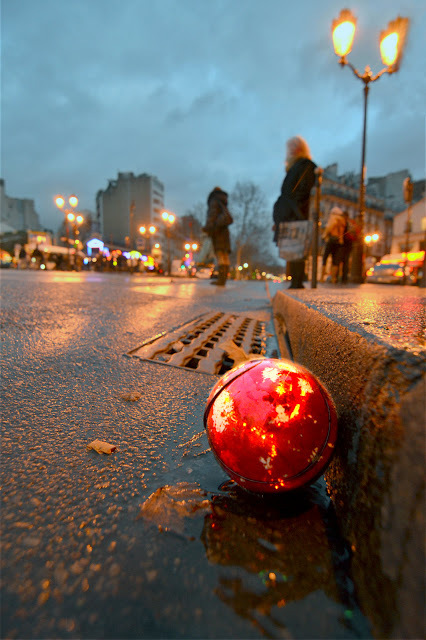 This year, I've found something different as a proof that Christmas is over: a broken Christmas tree ball! I know it's silly ;-) But when I saw it, I immediately thought it could make a cool photo and, well, I think it does (haven't I been very self-satisfied these past two days?!). I also got scolded by a taxi who probably thought "gee, these silly tourists, they really photograph the most stupid things!" Sadly Christmas is over! Today I took down all my Christmas decorations and threw out my Christmas tree. Christmas is over and my home is bare and bigger. Looking forward to the New Year! The photo says it all...brilliant. Oh how romantic that photo is Eric -- it really tugs at my heart. I love Christmas. This afternoon I went to buy a new umbrella. My umbrella from London after four years finally cracked. Would you believe that I saw an umbrella at Bloomingdales for $465? The handle was silver and in the shape of a dog or wolf. It reminded me of the Lon Chaney Jr. film "The Wolf Man" werewolf cane handle. Very theatrical. Could you imagine leaving that umbrella in an umbrella stand at a restaurant? Leave you in the cold grey dawn. Just seemed too many flies on you. I just can't brush 'em off. Come on up, come on up now, come on up. I think the angels are calling to this little red ornament. We took our tree and lights down today (early for us). Now I'm listening to your Moulin Rouge song by candle light (and screen light :-)) and catching up with your posts from this week. Glad you had a happy Christmas, Eric. Always love "your" perspective. love yesterday's and today's rainy shots suffused with light. great job. A most appropriate capture. Young guy like you can bend down that low for that shot! Envious! Heck if i'm taking down our trees yet! LOL Christmas will officially end here on day one of 2013. Your pic is fabulous. Rich hues and great perspective, with the small ornament representing something so much bigger. As for Mr. Cranky Taxi Man, he needs to relax. Eric, I'm a grinch when it comes to Christmas. But I love this pic. Ingeniously artsy. However, you must quit giving us tourists a worse reputation than we already have.haha! You even make Parisian trash look beautiful! As far as extending Xmas, have you ever seen Christmas trees trashed...in APRIL. Like I have? Omg! That is just plain beautiful! @Trishia ", I made reservations for 3 nights in Paris in May. It will be my first trip to France in 10 years. I'm bouncing off the walls:)" Excellent news! Congrats. We'll have coffee together when you come! @Lois. I surely would not want an umbrella that expensive. Like you say I would be far too scared to leave it somewhere. Well, that is a sorry sad remainder of Christmas. In some ways a broken ornament it's worse than a dried out tree. Ha I do think it made a great photo! Probably fell off the tree when the garbage men picked it up out of the gutter. Eric, what will do if your knees ever go? but actually Christmas is still going for me. Visiting Son and family this weekend. Then there is New year! Love Denise...hope this posts this time! Brilliant! It reminds me of the cartoon movie of How the Grinch stole Christmas and how when he took the tree up the chimney all that was left was a Christmas bulb on the floor. Kinda symbolic of how Christmas is in the heart of the giver for such a brief time of year! Wishing everyday was like Christmas! Christmas doesn't end on Dec 26! We should continue celebrating the 12 days of Christmas and continue on at least until Jan 6 (Epiphany) and preferably until Feb (Baptism of Christ).